The St. Gotthard Pass (Italian: Passo del San Gottardo) connects south and north Switzerland. Other than traversing the Gotthard tunnel, you can travel the new Tremola if you want to enjoy some of the views from within your car or on your motorcycle, while not losing too much time. 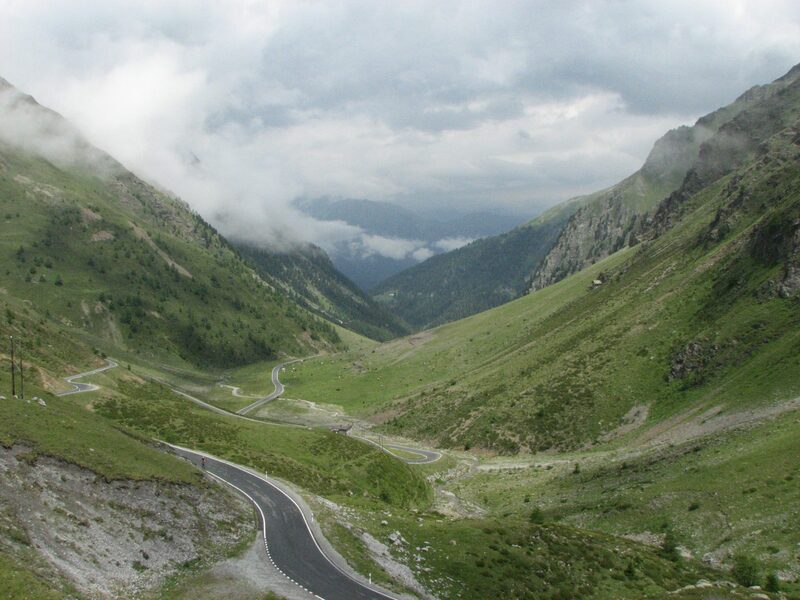 However, that also has some (long) tunneled sections and the far more interesting – and better cycle-able – road is the old Tremola between Airolo in the Italian-speaking canton of Ticino, and Hospental in the German-speaking canton of Uri. 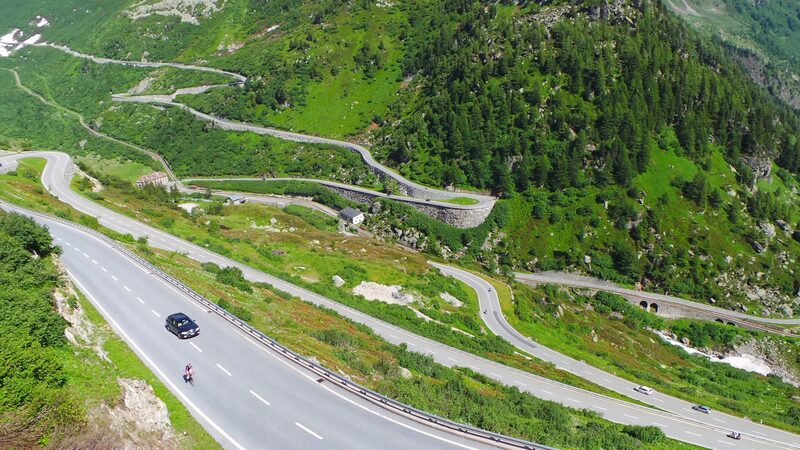 With a summit at 2,106 meters*, the Gotthard Pass doesn’t earn a high ranking in the European list of ‘highest passes’, but the old Via Tremola is a more than fair compensation. The Tremola road is Switzerland’s longest memorial road construction. It snakes up the slopes of the Val Tremola as a light-coloured ribbon from Airolo and offers impressive views. In the most spectacular section, the road climbs up 300 meters over a 4 kilometer stretch, incorporating no less than 24 hairpins, each with its own name. The Tremola road today still largely retains the appearance of the reconstruction completed in 1951. I cycled the Gotthard’s Tremola road as part of the ‘Swiss Stage’ at the end of my Giro d’Italia 2015 – report here, pictures here (Google+). From Airolo, you have the choice of taking the old or the new Tremola road – while the latter can be cycled, it’s also the ‘fast lane’, meaning lots of traffic, passing at high speed. Plus, there are a couple of tunneled sections, one of them quite long, that will not be enjoyable. Your best option is the old Tremola road, if only for the spectacular cobblestone section(s) and the breathtaking views along that road. This climb is 12.7 kilometers long, with an elevation gain of 932 meters (7.3%). After the relatively easy start, you’ll only have a short moment to catch your breath when passing the Motto Bartola intersection, with the entrance/exit to the new/main road. Once at the summit, you can pay a visit to the Gotthard museum there, or have a break at the ‘ospizio’. You may also take a short ‘side trip’ back over the new Tremola road, where you will have a fantastic view on the old road, just before the entrance to the gallery/tunnel, as seen in the picture to the right. The ascend from the north officially starts in Hospental, but you may start out of Andermatt, or even further (and lower) from Amsteg. 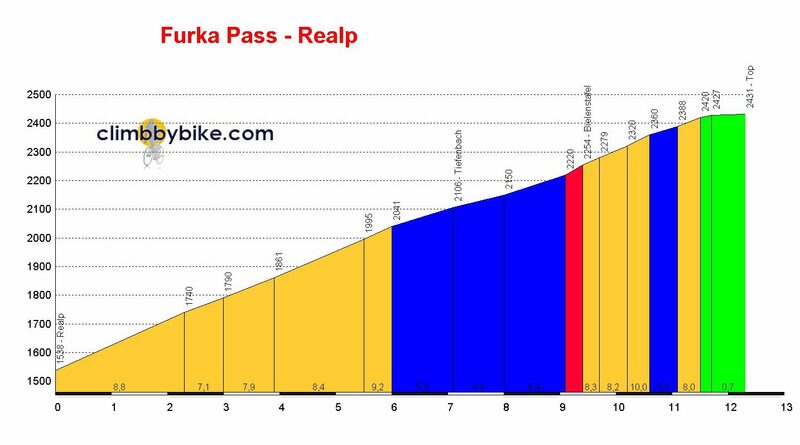 From Hospental, the climb is 8.6 kilomters long, with 610 meters of elevation (7.1%). This side offers nothing special – besides the grandeur of the landscape – and follows the main road. It’s only at some three kilometers from the summit that cyclists can leave the main road and take the old cobblestone road. It’s worth avoiding this ascend during the weekends in the summer/holiday season, as traffic can be pretty bad and the road is used as an alternative to the weekly traffic jams before the Gotthard tunnel. A little side-trip into Switzerland during the Giro of 2011: the Umbrail Pass, which connects to the Stelvio (from Bormio) just after its summit. Report on that stage here. At 2,501 meters it earns a top 10 spot in the list of highest paved passes in Europe and it is the highest paved pass in Switzerland. With an average grade of 8.5% it’s far from easy, but it’s a nice, steady climb, with beautiful views and it is not too busy with motorized traffic. The steepest part is actually right at the start, where, after a series of hairpins, you will be rewarded with stunning views of the Müstair valley with Santa Maria in it. Because of its open character, the wind may be an annoying factor in the upper part, were the road is fairly straight, almost “meandering” like a stream. Just past the summit, you’ll end up on the Stelvio – you can then climb the final, difficult, kilometers up to the summit of that (CBB), or descend to Bormio. Obviously the climb from Bormio is better known for its more famous twin, the Stelvio. 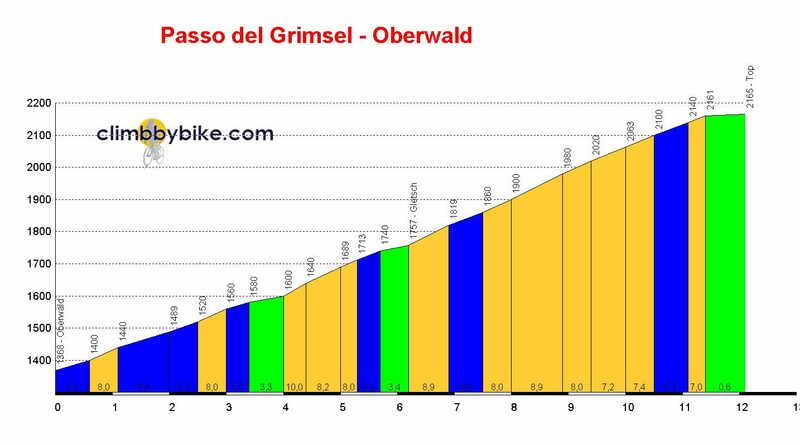 Up to the summit of the Umbrail and the split for the remainder of the Stelvio at the old customs building, it’s 18.3 kilometers long at an average of 7.1%. A combination (loop) with the full length of the Stelvio – from either Prato or Bormio – is harder than it looks. From Bormio you would first climb the Stelvio, descend to Prato and then circle around via Sluderno to Santa Maria for the Umbrail – this is the most obvious option. Counterclockwise from Prato, with the Stelvio first and the descent to Bormio is also possible, but getting to Santa Maria that way is much more challenging. You will first have to get over the Foscagno, take the bike-train through the tunnel Munt la Schera (now prohibited for cyclists) and then get over the Ofen pass.